A Royal Concern: Queen Azshara is plotting with someone on the Zanchuli Council. Her nefarious naga are not randomly attacking the coast, they are being directed. Nathanos should know about this. Deliver the letter to Nathanos Blightcaller at the Horde Embassy, in Dazar’alor. A Royal Concern: Your work within the Council is laudable. We do look forward to thanking you in person. It seems there were few relics to be found where you suggested. We have sent a new force, under his guidance to find what the others missed. He is certain, there is power to be found there. I am concerned that shattering the temple was not enough. The ocean is Gral’s temple. However, with his followers lost, it is but a matter of time. There are plodding Tortollans everywhere these days. Fortunately, their wits are as quick as their feet, they suspect nothing of what we do. A new world order, indeed. 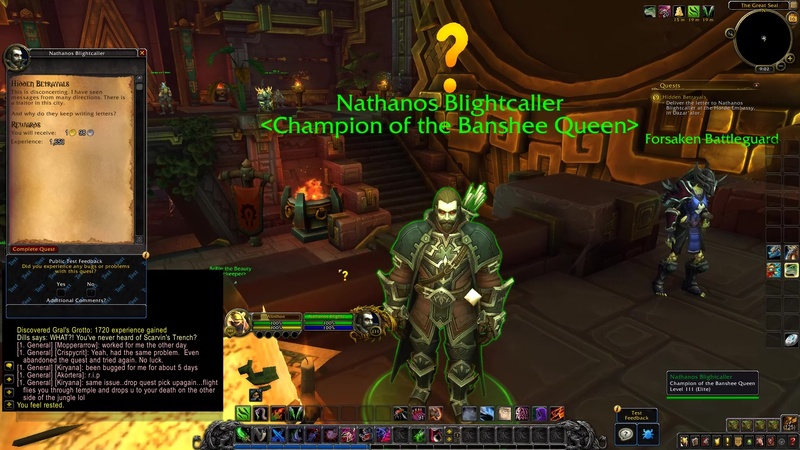 Nathanos Brightcaller: This is disconcerting. I have seen messages from many directions. There is a traitor in this city. And why do they keep writing letters?